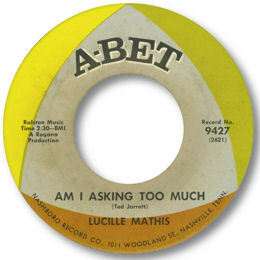 Lucille Mathis recorded for WLAC DJ Bill “Hoss” Allen in Muscle Shoals and Nashville. The material was leased to Excello for the two 45s issued on their Abet subsidiary. All four sides are very strong Southern Soul as you’d expect – and for horn enthusiasts like me three of the sides feature some great baritone sax work! 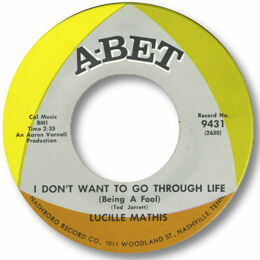 Of the Muscle Shoals cuts, Somewhere Out There is a typically well structured ballad on which Lucille’s rather “little girl lost” vocals can be heard to good effect. I Don’t Want To Go Through Life is a fine punchy dance song – yet more proof that the Fame musicians could swing with the best of them. Great chugging beat. Turning to the Nashville tracks, “I’m Not Your Regular Woman” is another cutting dance tune, but the pick of them all is the magnificent Am I Asking Too Much. This lovely Ted Jarrett ballad has a superb chord structure and I especially like the stop break with its “climbing” horn arrangement. Note ~ "I Don’t Want To Go Through Life" and “I’m Not Your Regular Woman” can be found on the fine Road CD "Nashville's Got The Beat" (RDBL 44). “Somewhere Out There” can be found on the Ace UK CD "The Heart Of Southern Soul Vol 1" (CDCHD 568) and “Am I Asking Too Much” is on Vol 2 (CDCHD 601).